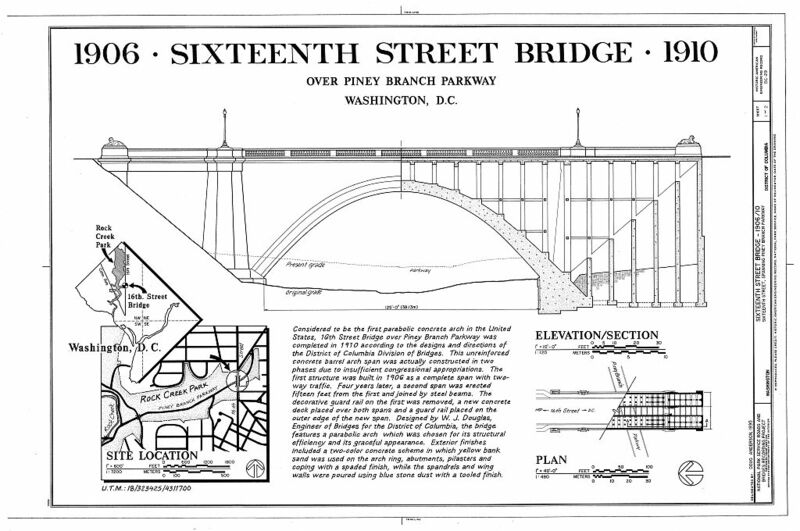 Sixteenth Street | Park View, D.C.
As most residents of Washington know, streetcars once provided the lion’s share of public transportation needs in the city, with horse-drawn streetcar service beginning along some routes as early as 1852. Even with the city’s fairly good streetcar, some residents of Washington found they were not served as well as other sections of the city. A good example of this was Sixteenth Street. While Seventh Street/Georgia Avenue, Eleventh Street (eventually north to Monroe), and Fourteenth Street all had good streetcar coverage, moving west the next trolly line was Connecticut Avenue. This created a gap in service that gave rise to alternative forms of transportation — leading directly to public bus service. In response to the need for transportation on Sixteenth Street, the Herdic Phaeton Company began serving the corridor in 1884. The service remained in operation until the company failed in 1896. This was followed in 1897 by the Metropolitan Coach Company, again operating herdics from Sixteenth and U Street to 22nd and G Streets NW. 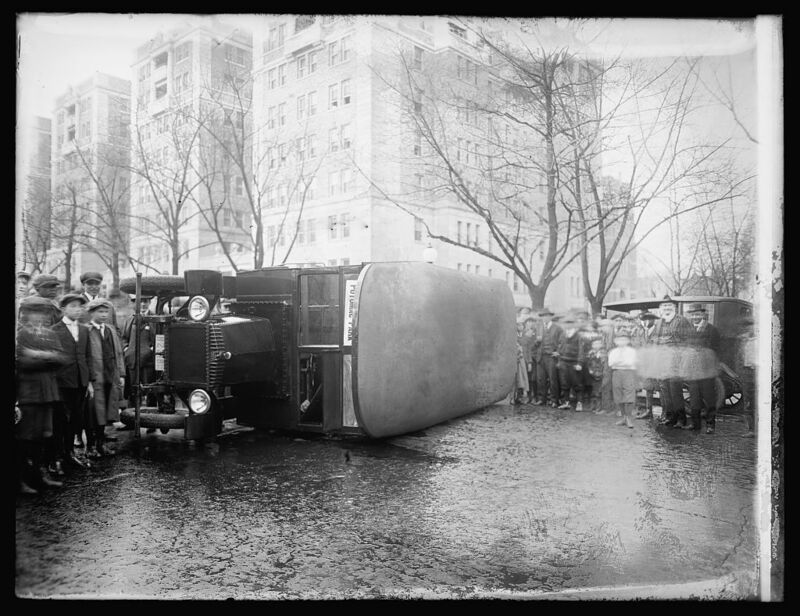 The Metropolitan changed from horsepower to gasoline motors in 1909, but the operation was not successful and the company ceased operation in 1915. The next company to take up this route was the Washington Rapid Transit Company six years later. 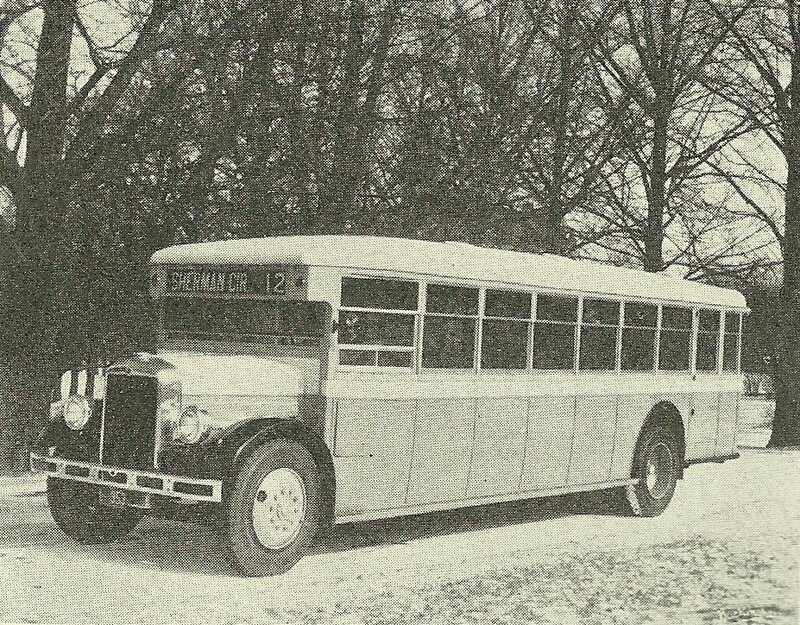 In response to developments in gasoline engines, improvements in pavement design, and the use of concrete for paving, the company incorporated in January 1921 and began operation on March 1 with ten buses of 21-passenger capacity and two routes covering about 5 1/2 miles of street. The new bus service was immediately successful. They ordered four additional buses and placed them in service on April 20. The increased fleet operated on three routes — Eighth and Pennsylvania Avenue, Potomac Park and Haines Point. Within the first six months the Washington Rapid Transit Company carried over 750,000 passengers and claimed public support existed for more routes. By September 1921 the company decided to purchase an additional 16 buses, and received the permission of the Federal Utilities Commission for two new franchises. 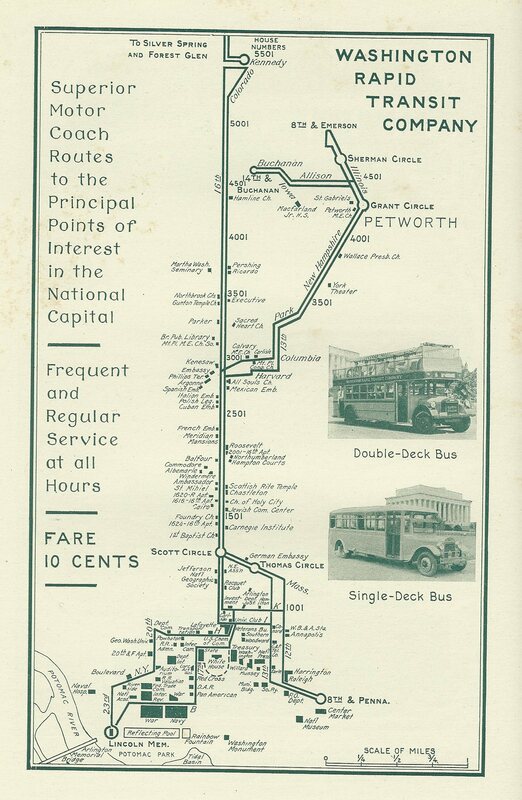 This 1927 map of the Washington Rapid Transit Company's routes provides a good outline of the Petworth Division route. It shows points of interest, such as Park View's York Theater. 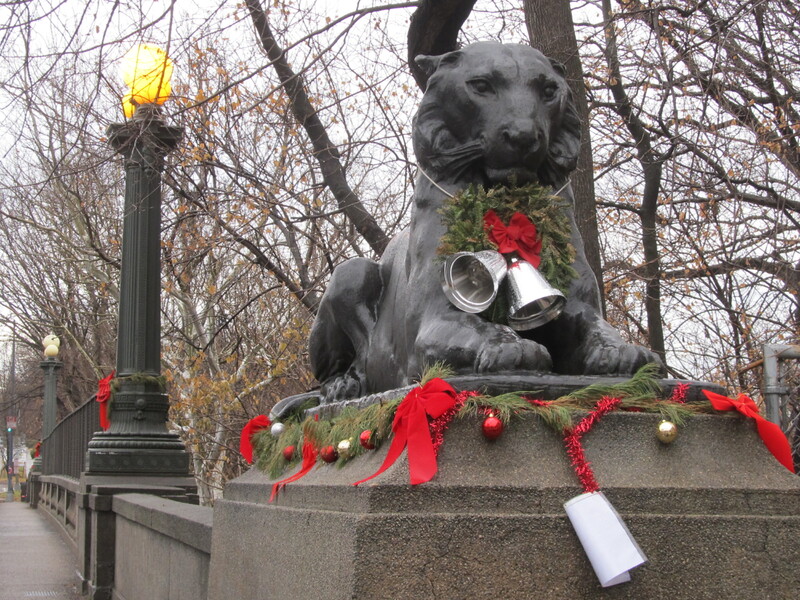 The first new route started at Eighth and Pennsylvania and traveled to Twelfth Street, to Massachusetts Avenue, to Sixteenth Street, to Harvard Street, to Thirteenth Street, to Park Road, to New Hampshire Avenue, to Grant Circle and return. This was known as the Petworth Division. The second new route started at Eighth and Pennsylvania and traveled to Twelfth, to Rhode Island Avenue, to North Capitol Street and return. This line was abandoned in 1923. By August 1922, the Washington Rapid Transit Company’s interest in extending their Sixteenth Street line north to the intersection of Alaska and Georgia Avenues drew the attention, and opposition, of the Washington Railway and Electric Company. Residents of Sixteenth Street sided with the bus company, declaring it was needed since it was nearly impossible to get a seat on the streetcar line. Washington Railway and Electric Company responded directly by expanding its operations to include buses. Washington Rapid Transit appealed directly to the District Commissioners that it was their belief that it was illegal for Washington Railway and Electric Company, or any street railway company, to operate motor buses. The Washington Rapid Transit Company introduced its first four double-deck buses on February 1, 1925, along Sixteenth Street. The double-deck coaches had awnings to protect top-deck passengers from the sun and rain and were a unique feature in Washington at the time. Washington Rapid Transit added six more double-deck buses to the fleet in 1926 owing to their popularity with customers. During this time, the Capital Traction Company and the Washington Railway and Electric Company also began to develop and expand their own bus operations leading to friction as the companies began to compete with each other. The areas where competition was the most fierce were in Chevy Chase (with Capital Traction Company) and Petworth (with Washington Railway and Electric Company). In both cases, the streetcar companies requested approval of new routes that would hem in and prevent further expansion by Washington Rapid Transit. These attempts were not completely successful. Ultimately, the Washington Rapid Transit Company merged with the Capital Transit Company in June 1936. Capital Transit was itself created as a result of merger legislation hammered out in the Senate in December 1932, which united the Capital Traction Company and the Washington Railway and Electric Company and instructed them to purchase Washington Rapid Transit. For the fifteen years that the Washington Rapid Transit Company operated, it continued to update its service, modernize its equipment, and improve its routes.